I was in Horseshoe Meadows for three days, primarily to dayhike Mt. Anna Mills which I dispatched with on the first day. I was more looking forward to these next two days where I had easier outings planned to a number of named and unnamed summits in the area which I had never managed to make time for. The highpoint of today's outing was Woolyback, an unofficially named 12,000-foot summit a few miles SE of Mt. Langley. I was particularly looking forward to hiking the high ridge between Owens Point and The Fin, crossing over Woolyback in the process. From the topo maps it looks like tame cross-country and should have fine views. The full loop I envisioned would take me to five summits all told, not a bad haul for less than 16 miles' effort. I picked as my starting point an old, unsigned trailhead starting from Horseshoe Meadows Rd, just east of where Cottonwood Creek flows under the roadway. There is limited parking on either side of the road and you have to have a good idea where the trail is to find it, but it's in decent shape and quite serviceable. There is a gate and a corral area as one enters the Golden Trout Wilderness just off the road. I followed the trail along the east side of Cottonwood Creek as it bends north and passes to the east of Golden Trout Crag. Here I struck off cross-country on an ascending traverse to the northeast towards Owens Point, first passing over Peak 11,380ft. A nice little class 3 surprise was found along the craggy summit ridge, a collection of granite crags that required some scrambling to reach the highpoint. The open summit has a nice view looking south to Horseshow Meadows and west to the Cottonwood Lakes area. Owens Point is to the northeast across a sloping meadow and it was in this direction I headed next. I spent about 40min covering the mile between Peak 11,380ft and Owens Point over easy terrain. Owens' modest summit (class 2) has a fine vantage point overlooking the valley below - pretty much what you would expect considering the name, and it's pretty impressive, dropping more than 7,000ft to the bottom. I turned west, descending a short, easy gravel slope leading to a saddle with Woolyback, then began the long, leisurely ascent along the ridgeline. It proved to be as easy walking in practice as I had anticipated from the satellite views and found it quite pleasant. As a bonus, a small herd of six sheep were found grazing in one of the high meadows along the way. They took note of me at a distance but didn't seem to mind much as long as I kept moving away from them. I traversed over to the northeast side of the ridge as I climbed higher, finding easier slopes there than on the southwest side or along the ridge. 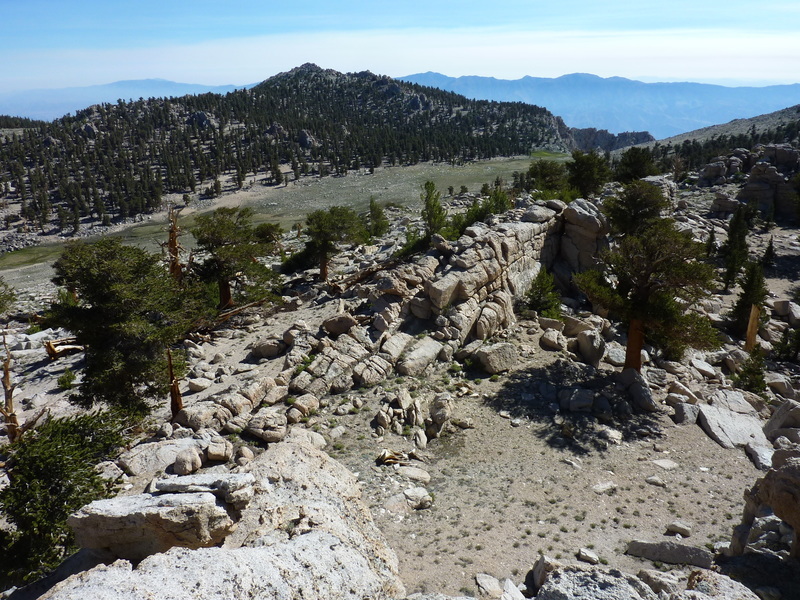 The last 15-20min was more of a rock scramble in the granite boulder fields found along the summit crest. It was 11:30a by the time I reached the highpoint of Woolyback. I found no register despite a small search though I know that a party less than a week later managed to find one. Mt. Langley rises less than 2,000ft to the northwest and almost looks close enough to make the effort to reach it. I was looking for a more relaxed day, so I wasn't going to be lured into such a proposition easily. Between the two summits is a minor feature that Secor has listed as The Fin, and it was to this I headed next. Despite the short distance of less than a mile, the traverse took me just over an hour. The route along the ridgeline traverses more of the granite boulders I had encountered near the summit of Woolyback and this was not broken by easier ground as one might hope. The final climb to The Fin from the south is a somewhat tedious affair thanks to a good deal of sand. The views are not appreciably different from Woolyback though one does get a better view of the route along the ridge to Langley. Though non-trivial, the route looks like it would go at class 3 or less, at least for the part I could see from The Fin, and would make for an excellent adventure at some future time. I was more interested in cooling off in one of the lakes below to the west than I was in climbing Langley so my focus was on the west side of the Fin. From above there appears to be some cliffs in the direct line down to the highest unnamed lake, but by skirting skiers' left I was able to reach some delightful sandy slopes that got me down more than 1,000ft in about 20min. I found the emerald lake devoid of people and took about 30min for a refreshing swim in the cool water. Afterwards I descended the drainage south to the larger Cottonwood Lakes finding a number of parties encamped along the lakes and trails including one with pack llamas. Back on trails, I followed these for almost two miles heading southeast to a saddle northwest of Golden Trout Crag. Unofficially named, this feature rises noticeably between the North and South Forks of Cottonwood Creek. It's an easy climb from the northwest saddle, only a few hundred feet up to the summit ridge and not far after that to the highpoint. The final summit rocks are easy class 3 and judging from the register, a popular climb for students of the Thacher School, an exclusive boarding school located in Ojai. There were a number of recognizable names from the Ridgecrest OPG folks including Bob Rockwell, Bob Joy, Dave Brown and others. This was the only register I found on five summits and it dated back only a few years. The summit offers commanding views of the Sierra Crest from Trail Peak across Horseshoe Meadow to the south, west to Cirque Peak, and northwest to Langley. I continued traversing across Golden Trout Crag, intent on finding another way off the mountain, one that would make for a shorter return. I knew from the morning views that there were cliffs on the SE corner, but figured I could find a way through them. I used a steep class 2 chute descending the east side, dropping more than 1,000ft to Cottonwood Creek. With only a trickle of water flowing, it was easy to find a way across to reach the trail on the east side. Once on the trail it was another half hour back to the TH where I arrived around 4:15p, making an outing of just under 9hrs. I spent a third night camped in the Horseshoe Meadow area with plans for a last hike before heading home. It was fairly warm upon my return to the van and it would take more than 4hrs before it would be cool enough to sleep. In the meantime I made shameless use of the van's air-conditioner while I made dinner and watched a movie. A rough life, this. Joshiah Spurr commented on 12/25/2017: I asked Cam, the director of Golden Trout Encampment, about getting from The Fin (i.e., "x3878" on Mt. Langley topo) to Langley from Wooleyback and he jested, "yea, if you like doing class 5 without a rope." I was on x3878 this fall and ventured towards Langley and decided a rope would be needed to rappel to the saddle above the topmost Cottonwood Lake. From there one can get to Langley.